Playable ads do just that by allowing users to actively engage with a branded experience or demo a gaming app before downloading it instead of passively watching a video. 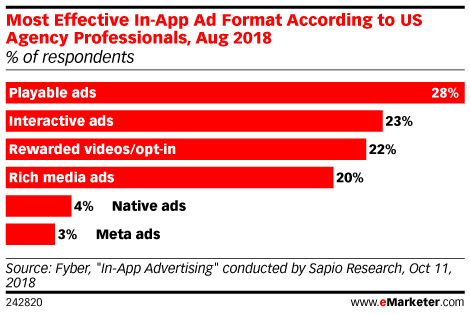 Early data suggests these methods work, with 28% of US agency professionals surveyed by Fyber citing playable ads as the most effective in-app ad format, followed by 23% who listed interactive ads. Google’s AdMob launched playable ads for their gaming partners last May, and Facebook launched them in August. In both cases, the ads were mostly used by game developers, but playable ads have potential for other industries. The downsides: Playable ads are difficult to create and are not supported programmatically. Read the rest at eMarketer.